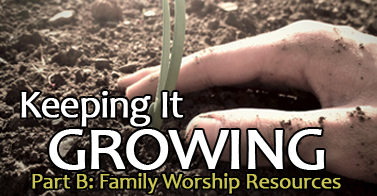 Last week, we discussed the necessity, importance, and purpose of family worship. We meet to worship as families because Christ has commissioned spouses and parents to evangelize and disciple their families. In an effort to help us all start or continue our family worship times, I’ve listed several principles and resources that I and many others have found helpful over the years. Pick a resource that brings the gospel to your heart. For discipleship to be effective you have to teach others to follow you as you follow Christ. You begin by applying the truths to your heart before you you make it to the kitchen table. If you are not regularly learning from the devotional or being encouraged by it, find another resource. Be excited, enthusiastic, and intentional. If you think family worship is a labor of boredom, your kids will as well. Have an infectious love for God’s Word. If you struggling with your attitude before family worship, spend some time in prayer thanking God for his salvation and your family. Set realistic goals. If your goal is to have five family worship sessions every day, you will probably fail. I would encourage you to try to have a family devotion at least once a week. I do understand that blended families and other situations can make even once a week undoable. Set realistic goal, but don’t let sports or worldly pleasures crowd family worship out of your schedule. Pick a reasonable goal and stick to it. Keep it simple. All a good family worship times needs is teaching, prayer, and singing. If you have little children, you be could wrapping things up with an off key rendition of Jesus Loves Me about 5 minutes after you start. Be flexible. If you are planning on talking about love from 1 Corinthians 13 and your children want to discuss the question of “Why do bad things happen to good people,” go with it. Encourage your children’s interest in the Bible. Model for them a dependence upon scripture. Below, I’ve put together a list of resources that I and other families have found helpful. Many of these resources our available in my office if you would like to borrow one. If you know of resources not listed here, please tell share them with us in the comment section. Beside The Still Waters:Taken from the Sermons of Charles Spurgeon this is a short and encouraging devotional that parents and older children would appreciate. The Big Picture Interactive Bible Storybook: Each Bible story is accompanied by references, a Christ connection and a question. The book also goes along nicely with the Gospel Project Sunday school curriculum, helping families and churches to work together. It a great resource for families with younger to middle school aged children. Big Truths For Young Hearts: Dr. Bruce Ware has created a systematic theology for kids. Using stories and conversations from his daughters’ childhoods, Dr. Ware has made deep Biblical truths understandable. Broken down into bit size sections, each chapter contains several memory verses and questions that will help you develop your family worship time. It would be a great resource for families with children of all ages. Bible Book Study: Take a book of the Bible and go through it a section/paragraph at a time. If you want to go more in-depth in your book study checkout either the NIV Application Commentary or the Read/Mark/Learn series. Both are easy reads. This is a good tool for families with children of all ages. Long Story Short or Old Story Long: These books are specifically designed with families in mind. Working through the Old and New Testaments respectively, each book is arranged in weekly sections that provide resources for five days of devotions. Each day consists of a passage of scripture, a brief commentary, discussion questions, and prayer points. It’s a great resource for families with younger to middle school aged children. Proverbs: There are 31 chapters in Proverbs making it an easy family devotion tool. Simply take the chapter or a few verses from the chapter that corresponds to the date on the calendar. Great tool for families with children of all ages. Psalms: There are 150 Psalms. You can make your family the devotion the Psalm of the day. After you work through Psalms 1-30, add another 30 and start the next month at Psalm 31. When you get to a month that has 31 days read all of Psalm 119. Great tool for families with children of all ages. Sermon/Sunday School Devotions: Simply note the passage of this week’s sermon or Sunday school lesson. Take your family back through the passage, asking questions that relate specifically to their lives. At First Baptist Church, we also post a family devotional on our children’s ministry Facebook page that contains scripture references, discussions and questions that go along with your child’s Sunday school lesson. Great tool for families with children of all ages. Catechism For Young Children: This is a series of 69 short question and answer sequences designed to help children understand the basic doctrines of faith. After going over the scriptural references that support the question, complete your devotion by having your family memorize one question per meeting. It is a great resource for families with younger children. Thoughts To Make My Heart Sing: A colorful book with short one page devotionals. Sally Loyd Jones does an excellent job of introducing important truths in an engaging fashion. It is a great resource for families with younger children. The Witkowski Plan: My wife and I Memorize Scripture together, working through a book of the Bible one verse at a time. After we discuss the word, we pray out loud together. On busy nights when we get home late, we make the Psalm of the day our devotion. Great tool for families with older children.